Based on the national game Nepal bāgh cāl, ‘Goats and Tigers’ is a predecessor to Draughts or Checkers. This is a two-player strategy board game played all over the world. Pieces are placed at intersections of the lines on the board. The four tigers start in the corners of the board. Goats and dropped into empty squares one at a time. Tigers win by taking the goat pieces by jumping over them and landing in an empty square just as in Draughts/Checkers. Goats win by surrounding the tigers so that they cannot move. 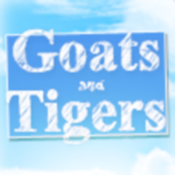 Full version allows play as both goats and tigers, provides three difficulty levels and a unique soundtrack. The perfect way to pass your time on that tube or bus journey.